"Highly recommended for all-ages graphic novel collections, especially those where O'Neill's earlier works are popular." "A beautiful, LGBTQ-friendly conservation fable." 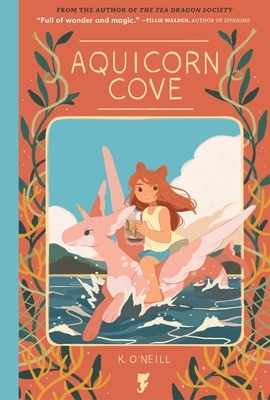 "Aquicorn Cove is a lush, tender tale of grief and environmentalism." "Aquicorn Cove is a story with strong, smart female characters who realize their impact. Katie O'Neill creates beautiful, heartfelt worlds that you will want to live in." "Aquicorn Cove is the charming, exquisitely illustrated, and LGBTQ focused book I would have loved as a kid. It’s full of wonder and magic and yet still manages to tug at the heart at the same time." "Aquicorn Cove is a magical delight. I barely put it down before my twelve-year-old niece had claimed it for her own. It weaves a story of loss and resilience with minimal words and charming illustrations. You'll fall in love with these characters and the world they inhabit. And like Lana, you'll want to do everything you can to protect it."